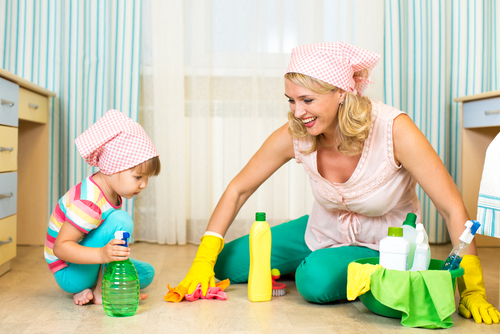 The New Year is a great time to start the process of spring cleaning. As nature moves through its cycle in yet another one of its harmonious seasons, the spring brings with it a sense of something new, something hopeful and something clean. The new year is the perfect time to get started on the cleaning phase. Here is an essential guide to getting all of those cleaning tasks done for your Singapore Housing Development Board Flat. This article includes what you need to clean, efficient ways of doing so and other helpful tips for maintaining your home during the new year for spring cleaning. Dusting is a very important way to keep the home free of dust, which can build up and even cause fires, especially dust build-up near electrical areas. Dust is also unhealthy. The small particles can be inhaled, which is not good for your lungs one bit. Imagine all the dust that builds up in those hard to reach places that you never even think about during the natural routine of your day. It just keeps building and building. When it becomes disturbed and airborne, we breathe it in without knowing. So grab a moist towel and some furniture polish and a dusting tool. There are feather dusters and special dust mops with extendable and movable joints for cleaning tough spots like the ceiling fan, the desk drawers, the windows and door frames and other weird places. Lamps and other furniture can be dusted as well. Also, don’t forget the vents. Those just blow dust around, as well as collect it. Rugs, Pillows, Couches and Chairs with Dust Beat those rugs like they tried to take your money! Seriously. Take them outside with a wooden dowel and beat the dust out of them to get them free of particles. Pillows can be fluffed onto the floor before vacuuming the floors of the home. Couches and chairs also build up a lot of dust, crumbs and other small particles not even directly seen by the human eye. If you can get couches or chairs outside, you can beat them as well, but not as rough as the rug. You don’t want to destroy your furniture. The wind can take away some of the dust outside, but a better method is to vacuum them with a hose attachment very thoroughly. 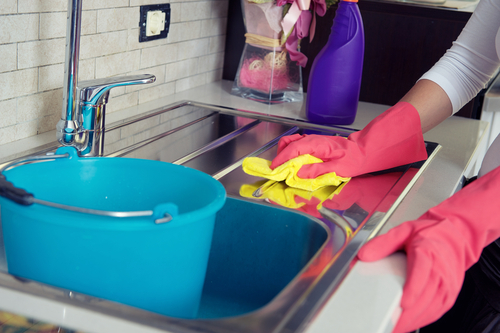 Assuming you have washed all of your dishes at home, you can use the same cleaning products to clean all of your plumbing areas around the sinks, showers, bath tubs and toilet areas. Using a bathroom cleaner or bleach, scrub them back to front thoroughly. The bottom and back of toilets are the worst, but a scrubber stick will work best. Use toilet bowl cleaner for the inside of the toilet bowl and make sure to scrub the holes well. Sinks can be cleaned with powdered cleaning products. An old toothbrush works as fine tool for scrubbing the metal rings and inside of the sink basin areas. Showers and tubs can be cleaned with the bathroom cleaning solution as well and quickly rinsed. Remove any nasty mold that might have started to develop and paint if you have to. Windows and mirrors Cleaning the windows and mirrors can actually make the appearance of your house fresh, inviting and bright. The sun will shine in through your windows much brighter and clearer. The raindrops will even seem more detailed in appearance if you’re really paying attention. Use a blue window cleaning solution. Most of the time they are blue, sometimes they are clear. Another simple solution is plain hot water and a towel. For really tough stuck on particles to the window, you can either try using a squeegee or just scrub hard until your arm gets numb. maybe worse. 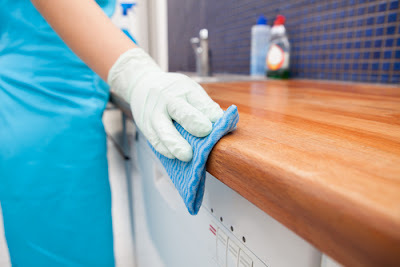 Spring cleaning during the new year is the best opportunity in the world to get all of those particles, germs and other materials our feet have been carrying with them all over the house. Start by vacuuming all of the rugs and carpet throughout the house. It works great to use a small stair cleaning vacuum for stairs obviously, but if you do not have one, just try to drag the vacuum cleaner up and down if you can or see if the hose attachment is enough. Sweep and mop the floors throughout your home and move all of the furniture. Get behind appliances. There is a lot of dirt and bacteria that can build up in those areas. Appliances are the most overlooked part of the home, where food, particles, bacteria, mold and lost items can build up and raise health concerns. Mold is never a good thing. Bacteria and insects are dangers as well. Use bug spray or hire an exterminator if you need to. Clean under and inside all of your appliances very thoroughly. The new year is a perfect time to get serious about it. The inside of the fridge can become a cesspool of germs, bacteria, old food and unhealthy conditions if left unchecked. Defrost your freezer and clean it thoroughly, then turn it back on. You should unplug the refrigerator to do this. Clean all the shelves in the refrigerator and freezer after you remove all of the food from inside. Throw out all the old, unused food that is just creating a bigger mess. Wipe out any inside drawers too. Wipe out gaskets. Do the same with your cooking units.